On March 8, 2019, the Record of Decision (ROD) was received from the Federal Highway Administration for the Mid-Currituck Bridge (MCB). Simply put, the ROD document is formal federal approval of the Environmental Impact Statement (EIS) for the MCB. It authorizes the North Carolina Department of Transportation (NCDOT) and the North Carolina Turnpike Authority to move the project forward and begin acquiring land needed for the project’s right of way, to obtain environmental permits and advance construction plans. The official NCDOT press release stated that the "need for an east-west crossing of the Currituck Sound was first identified in 1975 and formal planning began in 1995 by the North Carolina Department of Transportation. The Turnpike Authority became involved in the project in 2006 when local leaders considered funding the project with toll revenue." The Record of Decision allows NCDOT and the Turnpike Authority to move the project forward and begin acquiring land needed for the project’s right of way, to obtain environmental permits and advance construction plans. 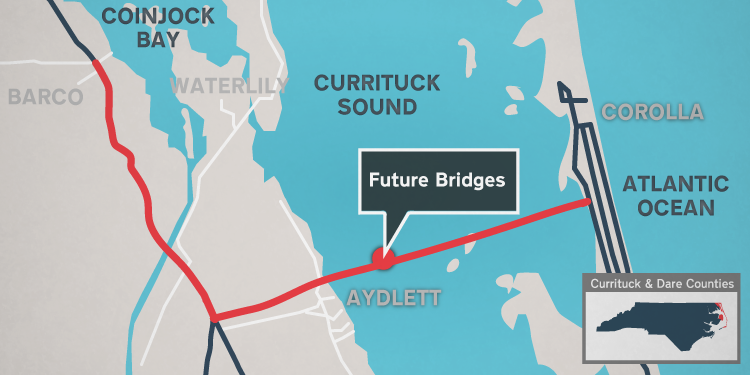 As described in the Record of Decision document: "The proposed action includes construction of a 4.7-mile-long, two lane toll bridge (the Mid-Currituck Bridge) across Currituck Sound between the communities of Aydlett on the mainland and Corolla on the Outer Banks, an interchange between US 158 and the mainland approach road to the bridge, a bridge across Maple Swamp as a part of the mainland approach road, limited improvements to existing NC 12 and US 158, and primarily reversing the center turn lane on US 158 to improve hurricane clearance times." Public safety will be one of the biggest benefits of the Mid-Currituck Bridge. An additional hurricane evacuation route for Outer Banks residents and visitors is long overdue. Currently, hurricane evacuation clearance times fail to meet the state designated standards of 18 hours. The 40-mile shortcut is expected to provide a travel time savings of about two hours, one-way, during peak travel periods. While Currituck County officials are encouraged by the Record of Decision, they also understand that federal approval will likely trigger lawsuits by groups opposed to the MCB and organizations such as the Southern Environmental Law Center. In a 2017 letter to Jim Trogdon, the NC Secretary of Transportation, one opposition group expressed concern about "the effect the bridge would have on natural resources and character of the Currituck Mainland and the Outer Banks." Another 2017 op-ed published in the Virginian-Pilot states that "public officials have used a fabricated need for increased hurricane evacuation capacity" to "instill fear" and "drive support for the bridge." In a Daily Advance article published on Friday, March 8, Rep. Bobby Hanig, R-Curituck was optimistic that any pending lawsuit would not be "a long, drawn-out issue." Where do YOU stand on the Mid-Currituck Bridge?